Producing an exceptional retail package is a combination of choosing the right structural design, material, print method, and graphic elements. The options within each of these categories are many, and your choice in one area may influence or dictate your choice in another. Depending on your product and the end result that you want to achieve, you may use any one of these considerations as your starting point in creating a successful outcome for your box or display. When it comes to retail, quality counts. Brands understand that in the retail environment consumers will be face-to-face with their product packaging, whether it’s a corrugated box or point-of-purchase display. Print quality and graphic elements are highly important in this competitive environment. Traditionally, the go-to print solution for retail packaging applications has been litho lamination, also known as litho lam. That’s because this method offers fine detail in full color across a variety of mediums. In particular, litho lam shines when it comes to corrugated packaging and retail displays because it offers an impressive shelf-ready finish. Until recently, litho has been the only print method available to deliver this level of quality for high-volume runs. However, thanks to innovations in digital print, particularly with the new HP PageWide C500 press, digitally printed packaging can now compete with litho lam print in the retail landscape in both quality and scale. If you’re deciding between litho lam versus digital print for your product or retail packaging, we’re here to help you weigh out the pros and cons of both. Litho lam is the process of printing decorative graphics onto paper liner board by way of offset lithography, and then laminating that printed liner board onto a backing board (such as corrugated). Offset lithography is based on the concept that oil and water repel one another. Lithographic presses utilize two print plates – a positive and a negative – to transfer high quality color graphics onto a suitable substrate. The positive plate has a smooth surface that accepts oil-based inks and repels water. The negative plate has a rough texture that absorbs water and repels oil. Rubber rollers are used to extract water from the negative plate and expel the ink from the positive plate. They then transfer the image onto the print medium. A separate print plate is needed for each color (CMYK) to be printed. Because litho lam prints to the liner board before it is attached to the corrugated fluting, it has the advantage of printing on a smooth surface. Corrugated material, while excellent for product protection, creates a challenge when attempting to achieve fine detail and high quality full-color print. 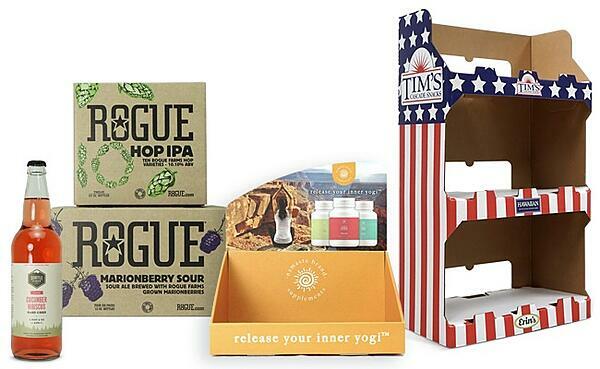 For high-volume print runs, litho lam can be a cost-effective way to produce retail-ready packaging at a large scale. When a brand requires tens of thousands of identical impressions (or more) without sacrificing quality, litho lam is a likely option. There are things that come with the territory of a litho lam job that must be considered when selecting the print method for your packaging project. Litho lam often requires generous lead times (several weeks), some type of minimum volume order, and built into the price will be tooling and setup costs associated with manufacturing the print plates and prepping the press for production. None of these aspects of litho lam are a drawback if your project has ample time, budget, and the right volume to justify the investment. An additional consideration becoming increasingly relevant is customized messaging. Millennials and Generation Z demand more from today’s brands, and a personalized experience driven by packaging can have a significant influence on consumer purchasing decisions. Because litho lam depends on print plates to transfer images onto packaging (resulting in mass production), creating targeted campaigns comes with a cost. Additional sets of plates must be manufactured and purchased for each artwork variation that is to be printed. Digital print for wide-format corrugated packaging and display offers many of the same features as litho lam, along with some added benefits. Fully CMYK color printing: Digital delivers full color printing at no additional cost per color. Reduced tooling costs: No print plates must be manufactured and purchased for digital print. Reduced time-to-market: Digital print is ready to go to press as soon as the artwork file is available – this means your packaging is in-hand in days, not weeks. Variable artwork: With digital print, every impression can be completely unique, opening the door to customized and personalized marketing. No minimum order volumes: Digital print is calibrated so that the first impression to the last are identical in quality, and thus order sizes of 1 can be achieved. High maximum volume order: Digital print has advanced in speed and quality in recent years and manufacturing plants running the latest equipment can produce high-volume orders with ease. Technological developments in today’s digital presses continue to push forward to deliver the highest quality print at a comparative speed to traditional print methods. These developments unlock the potential of digital for brands that require a scalable solution. Imagine a world where you can launch a campaign with 50,000 packaging units that all feature a unique artwork impression. With digital print, that world exists today. Enter: the HP PageWide C500. The C500 Press combines the best of worlds — delivering litho lam-print quality with the flexibility and speed of digital print. The C500 press also has the added advantage of using food-safe, true water-based inks. Brands producing products for sensitive applications, such as food and beverage, cosmetics, children’s products, and pet products can have peace of mind knowing their packaging is safe for the consumers it comes into contact with. Brands that once relied solely on traditional analog print methods now have the opportunity to explore the possibilities of digital, while maintaining the high level of quality and consistency they expect from litho lam. The HP PageWide C500 press is the perfect machine to produce digitally printed corrugated packaging at scale. This machine is complemented by additional presses offered by HP, including the HP Scitex 17000 and 15500 presses, which utilize a larger print bed to produce bigger products, such as digitally printed corrugated retail displays. It is important to note that every digital press may use different ink types, which are intended for different applications. Be sure to work with a qualified Packaging Advisor who can help you understand which ink type and press combination is the best fit for your particular packaging needs. Litho Lam vs. Digital Print: Which Print Method is Right for You? Choosing between utilizing litho lam or digital printing for your packaging project depends on your specific needs. If you’re running 100,000 identical impressions for a campaign set to launch in three months, litho lam may be the more competitive choice. If you’re short on time, desire any level of variable graphics, or have specific volume needs, digital print is a great solution. Every packaging project is unique. In order to produce effective retail packaging, we recommend working with a dedicated Packaging Advisor to develop a comprehensive game plan. Your Packaging Advisor can also help determine if your project is a fit for the C500 press. For brands with a presence in the Pacific Northwest, The BoxMaker is proud to be a resource for all of your packaging questions and needs. We have been pioneering digital print for more than eight years and run the largest Digital Production Center for packaging and display in the PNW region. If you’d like to learn more about digital print, signing up for a BoxMaker University class is a great way to discover new applications for your brand. Each session is led by an experienced packaging expert, who brings a wealth of industry knowledge at your disposable. Take a look at our upcoming sessions and sign up for our email newsletter to be notified when BoxMaker University comes to your city.